This homemade pizza dough is easy to prepare and knead by hand. You could also put the dough in a bread machine on the dough cycle. You'll find instructions for baking the pizza along with some topping suggestions below the recipe. Use a commercial pizza sauce or the quick homemade pizza sauce below. Put the warm water in a cup; sprinkle the dry yeast over water and stir in sugar; let stand for about 10 minutes, or until it begins to foam. Combine 2 1/4 cups flour and salt in a large bowl; add the olive oil and the yeast mixture and stir until a stiff dough is formed. Turn dough out onto a floured surface; knead for about 5 minutes, or until smooth and elastic. Add extra flour as needed to keep the from sticking to your hands or the kneading surface. Place in a large bowl greased with shortening or butter; turn dough over to coat the dough well. Cover with a clean dish towel and let rise in a warm place for about 30 minutes. the dough should double in bulk. Heat the oven to 425 F (220 C/Gas 7). Lightly grease a 12- to 14-inch pizza pan and sprinkle with a few teaspoons of cornmeal. Punch down the dough; roll and stretch the dough to fit the prepared pizza pan. Keep dough slightly thick around the edges. 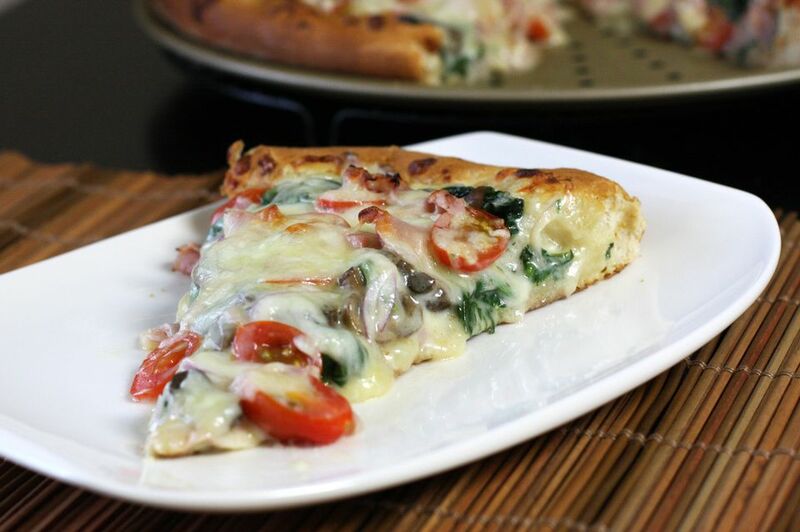 Add your family's favorite toppings and cheeses. I recommend 3 to 5 toppings plus cheese, but there really are no limits. Bake the pizza for 15 to 20 minutes, or until the crust is browned, cheese has melted, and toppings are hot. Meat: pepperoni, ground beef, Italian sausage, bacon, ham, small meatballs, marinated grilled or fried chicken breast, barbecue chicken, steak strips. Veggies: red onions, bell pepper strips, sliced black olives, jalapeno peppers, mushrooms, tomato slices, spinach, fresh basil, pineapple, roasted red peppers. Cheeses: feta cheese, fresh mozzarella, shredded mozzarella or a mozzarella and cheddar blend, vegan cheese. Quick Pizza Sauce - Combine 1 can (14.5 ounces of diced tomatoes with 1 can (6 ounces) of tomato paste, 2 tablespoons of olive oil, 1 1/2 teaspoons dried leaf oregano, 2 teaspoons minced fresh garlic, and 1 teaspoon of sugar in a food processor. Pulse until smooth. Taste and add kosher salt and freshly ground black pepper, to taste.